Nutritional disorder – manganese (Mn) deficiency. Manganese (Mn) deficiency begins as an interveinal chlorosis on the upper leaves (Figure 1). As the symptoms progress, the interveinal chlorosis takes on a pale netted appearance (Figure 2). This symptom will work its way down the plant until it covers the majority of the foliage. Symptomatic plants will start to become stunted when compared to healthy plants (Figure 3). At this point, symptoms begin to diverge between burley and flue cured tobacco. With advanced symptoms, burley tobacco will start to develop small white spots (Figure 4), but will retain the prominent netted chlorosis observed earlier. The majority of the foliage will also become very pale, with only the youngest leaves remaining green (Figure 5). Flue cured tobacco will also begin to develop white spots, however these spots will quickly grow larger and become much more noticeable than the netted pattern (Figure 6). These large necrotic spots will cover the majority of foliage, and occur primarily surrounding the midrib of the leaf (Figure 7). The spots have a paper-thin texture and will tear very easily, quickly giving symptomatic leaves a ragged appearance. Advanced symptoms may be seen in the 360-degree image below (Figure 8). A plant exhibiting manganese deficiency photographed in the field (Figure 9). Figure 10 shows advanced Mn deficiency. Figure 1. Early manganese deficiency symptoms occurring on the upper leaves (right), compared with the upper foliage of a healthy plant (left). Figure 2. The pale netted pattern of chlorosis that occurs first on the upper foliage of manganese deficient plants. Figure 3. Manganese deficient plants (right) will become stunted when compared with healthy tobacco plant (left). Figure 4. White spotting will develop on manganese deficient plant foliage as symptoms worsen. The white spots typically occur near to the midrib. Figure 5. Foliage of burley tobacco plants will become quite pale as symptoms become severe, with only some green coloration remaining on the youngest leaves. Figure 6. Flue cured tobacco will not become as pale, but will have much more prominent necrotic spotting as advanced deficiency symptoms. Figure 7. Leaves of flue cured tobacco with severe manganese deficiency will have very large necrotic lesions surrounding the midrib and throughout the center of the leaf. Figure 8. 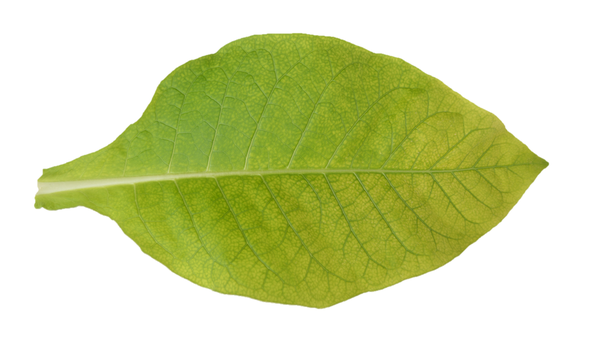 Advanced symptoms may be seen on this 360-degree .gif image of a flue cured tobacco plant. Figure 9. Field view of manganese deficiency. Figure 10. Advanced Mn deficiency. Early symptoms strongly resemble weather fleck, which is caused by exposure of plants to high ozone concentrations. These two issues are nearly indistinguishable; therefore, producers should collect tissue and soil samples to assist with correct identification. Manganese is required in low concentrations, so deficiencies under field conditions can occur, but are uncommon. The sufficiency range for manganese is between 20 and 250 ppm for burley tobacco. A slight refinement of the range is available for flue cured tobacco, with 20 and 250 ppm Mn being recommended from planting until maturity. A wider range of 20 to 350 ppm Mn is recommended at harvest for the upper and middle leaves or 18 to 350 ppm manganese for the lower leaves. Manganese levels greater than 1,000 ppm are considered toxic. This situation usually occurs when the soil pH is low (<5.4). Manganese deficiencies are rare, but can occur when tobacco is grown in soils low in manganese and where pH is 6.2 or higher. These conditions are common to the Coastal Plain where soils have been overlimed to meet the needs of other agronomic crops. Manganese deficiency can be corrected with soil or foliar applications of several Mn fertilizer sources; however, Manganese sulfate appears to be preferable because of application flexibility (foliar or soil) and low cost. Ultimately, to correct manganese deficiency producers should apply 0.5 pounds per acre foliar, three pounds per acre banded, or 10 pounds per acre broadcast. Provide manganese with your fertilization program. Manganese will be provided in sufficient quantity with N-P-K fertilizer sources blended for tobacco. If producers are not using N-P-K sources and have transitioned to prescription based fertility programs, then it is best to only apply manganese if needed. Additional manganese is not typically required when soil pH is below 6.2.